The last few days of Sail for Gold saw many American sailors stepping up the game and moving to the front of the fleet. Two bronze medals were won by Zach Railey in the Finn class and by Anna Tunnicliffe, Molly O'Brien-Vandemoer, and Alice Manard in women's match racing. US sailors swept the Paralympic division, with two gold medals in the Skud - 18 (Scott Whitman / Julia Dorsett) and Sonar (Hugh Freund / Maureen McKinnon-Tucker) classes. My teammate Ben Barger had one of his best performances ever, with 9th overall in the RS:X men's fleet. The final days of the regatta saw all the changeable conditions possible in Weymouth. The third day many classes had a break as the wind was too strong on the outside courses (which I've written about in the previous entry). All fleets postponed for winds gusting over 30 knots. Although it was really nuking for the first few days, the wind dropped a lot for the last two days of the final series. We experienced a few days of Indian summer and four races in winds of 5-10 knots. The last day of the regatta was going to be a treat as I would get to watch my teammate Ben in the RS:X medal race. However, hot, hazy summer decided to descend on Weymouth, and conditions were pretty glassy all day. Even though there was no wind, the committee decided to call the men out anyway. After about 15 minutes of everyone hanging out on their coach boats, they decided to abandon the race. Many fleets had their medal races cancelled, which was a disappointment for the huge British media presence. I had a lot of frustration these last days as being tired and sick was starting to catch up with me. The wind was very shifty and light, making for a difficult transition back to pumping conditions. My focus every day was on recovery, and some new stretches I learned facilitated that. Although I didn't sail as well as I expected I could for this regatta, it was still a great experience to be at the Olympic venue for such an extended period of time, learn all the possible conditions, and be well-prepared for each coming year. I would like to thank my sponsor, Compass Marketing, for making these important events possible for me to compete in. Patience is the thing I strive for the most in this sport. I'm used to being able to do most sports well simply because I'm an athletic person. However, in sailing, small gains come slowly and can be invisible in the results. I'm out of my comfort zone in the really big breeze, and it shows. This is the very reason I went to San Francisco and the Gorge this summer. I'm pushing my wind range up higher and higher, but it's slow progress so far. What I am the most happy about from the past two days is that my tacks and jibes are improving, and my upwind technique is getting much better. We've had two races each day so far, and all races have been on a windward-leeward course due to the constraints of the harbor. It's actually quite fun going around and around the course like a racecar, as it gives you lots of opportunities to practice maneuvers. Today we were postponed for a few hours in the morning, as the wind was gusting to 35 knots. Later, however, conditions calmed down a bit to around 20+ knots (although there were a few lulls and high gusts) and the committee was able to get our races off in the harbor. The boards and the 49ers were the only fleets to sail today. Although most fleets sailed yesterday, conditions were actually a bit windier. I felt racing was called off a bit prematurely for the rest of the boats, but the committee believed that outside the harbor walls conditions were unsafe. Tomorrow the wind will be lighter, and all fleets should be ready to go. The northeast wind we have been experiencing for the past week is apparently a "summer" condition. Although temperatures have been sometimes chilly, it's been sunny and dry, which is great for drying out wet gear. Northeast conditions are expected throughout the rest of the regatta, but we should have about 20 knots tomorrow. From what I've experienced so far at this venue, this direction doesn't get quite as nuclear as the normal southwest breeze. Northeast is shifty and gusty, and on the racecourse today we had as much as 15 knots and as little as 6-8. The boards are still inside the harbor walls, but we are sharing the harbor with the paralympic fleets, so the race committee is forgoing the normal trapezoid course in favor of a windward-leeward course to save a bit of space. There are 10 races in the series, so we are on schedule for two a day. Today I had some good and bad moments. Although I had a good start for the first race, I started with the really fast girls in the fleet. After the start, I got rolled and didn't tack out because I was too focused on my plan for the upwind...rookie mistake that put me towards the rear of the pack. I had a tactically sound second upwind and made up some places, and had some really good jibes through the slalom finish. I had an incredible start during the second race, which turned out to be a little too good as I was over early, adding an OCS to my score. Overall I wasn't unhappy about my day, as there were many things that I improved greatly. The rest of the American team had a bit of a shaky start to the regatta (except for Ben, who is in 6th place in the RS:X men's fleet) but as everyone is learning the venue, I expect we will bounce back quickly. I'm enjoying the back-to-back regattas as it forces me to relax and focus on the learning process. The final 2009 World Cup event, the Sail For Gold Regatta starts Monday at the Portland Sailing Center in Weymouth England, site of the 2012 Olympic sailing regatta. This is the first of three annual pre-Olympic test regattas for the sailors to become familiar with the local winds and currents that will influence our training over the next three years. 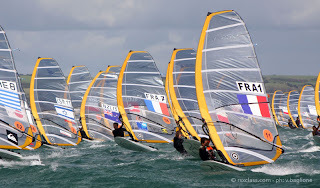 China's local conditions for the 2008 Olympics were light winds but the Weymouth venue promises to provide more all around conditions with the likely potential for strong winds just as we saw last week at the RSX World Championships. These pre-Olympic regattas also provide an opportunity for the various countries to ramp up their organization, logistics and support structure to maximize their team's medal winning potential. The US Sailing Team AlphaGraphics officials held a meeting tonight with all the US sailors present at its impressive operation center. The facility is being provided to us for the next four years and is directly across from the Olympic venue. It provides a place for us to meet before and after racing and we can store our equipment and coach boats there year round. We are sure to have multiple training camps here outside of the Sail for Gold Regattas in the coming years. The weather has been great during the break as you can see in the picture below that was taken from Weymouth's Chesil Beach of the Weymouth and Portland National Sailing Academy. I've been feeling under the weather since the end of the RSX Worlds ended. I have taken the last three days off from sailing. I'm still trying to shake my cold and other related aliments. The racing starts tomorrow (Monday) and my coach told me not to worry because I sail better when I'm sick. We will see if this holds true. The Worlds have finally concluded yesterday with beautiful weather for the medal racing. Medal races can be high stress, as the weighted results can make or break a sailor's regatta. We saw some seriously good sailing today with impressive finishes. In the women's fleet, Marina Alabau from Spain sailed conservatively without any big mistakes to keep her points lead for the World Champion title. Her teammate, Blanca Manchon, finished fourth, also maintaining her second place. Charline Picon of France upset Agata Brygola (POL) to take third. Agata has had a phenomenal regatta, and after a year of not being on the Polish Olympic team, has completely risen to the top. 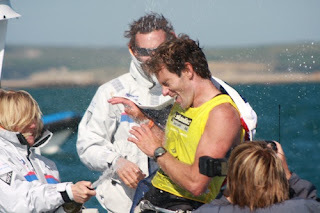 In the men's fleet, local British sailor Nick Dempsey impressively won the medal race and the championships, thrilling the British media. The second place finisher, Nimrod Mashiah from Israel, almost lost his regatta in the medal race after he fell at the start. As he went down and the gun went off, there was a collective gasp of horror from all the spectator and coach boats. He recovered quickly, although he was behind the entire fleet. By the first windward mark, he was going so fast that he caught three sailors to finish sixth, keeping his points lead. Dorian van Rijsselberge, a very talented kid from the Netherlands, finished second in the medal race to take third place. The racing for the silver fleet was cancelled on the final day, much to everyone's disappointment. A container ship was hanging out on the racecourse, making a normal trapezoid course impossible. The committee was running one fleet at a time on a windward/leeward course, and with four fleets to finish, they ran out of time before the medal races. I went sailing anyway and blazed around the slalom course for a while between races, practicing jibes. We have a few days off and then the Sail for Gold ISAF Grade 1 regatta begins. I seem to have both a small sinus infection and some kind of British disease of the guts, so I'm resting and will do some light recovery running and calisthenics. Sail for Gold will be another great opportunity to learn more about the Olympic venue and we are (tiredly) looking forward to the racing. With one race to go, the RS:X World Championships is almost over. With life focused around racing, the days go quickly. In the silver fleet, I'm finally finding my groove. My results are a tribute to progress: jumping forward, falling back, but in general putting new knowledge to good use. Yesterday I posted a 14th and a 6th in marginal conditions. I'm quite proud of the 14th, as it came after I saved my own race. I was slow to accelerate off the start, and had to tack out and go to the wrong side to get clear air. I rounded the windward mark almost last. However, I had two really strong downwind legs and caught half the fleet. The next race, I knew where to go. My start was excellent, as I had more space on the line and got out from under the fleet early in clear air. I dedicated my start to my Polish coach, Romek, as it was exactly the way he has taught me. and my speed was good with the daggerboard down. I consistently gained places and had a strong finish through the slalom. Today my results were really upside down...I posted a 3rd and a 19th. The third was fantastic as it shows what I can do when I race well. Our entire race was light planing conditions, with an unusual north wind. Big gusts were coming down the course, and racing today was all about finding the pressure. Racing well is all about performing each individual portion of a race well, and I managed to piece together a good race. My start was great, and I got out into clear air. My speed was good in the flat water, and I hit the shifts and pressure right on the first two upwind legs. Pretty soon I was ahead of the pack by a long ways....which felt great! Racing at the front of the fleet seems easy when you've gotten there, but it's really tough to work your way up from the back. The wind was more fluky at the start of the second race, and I wasn't clean off the line. I had tried for a planing start when most of the girls were daggerboard down. I was forced to go daggerboard down for a while, and because there were so many holes, never got out of that mode into planing. I chose the wrong side on the first beat, and was constantly fighting with the others to get ahead. The result is a testament to a bad start and first upwind leg. At least I'm showing improvement. We have one race tomorrow, and then the World Championships end for yet another year. Days 2 and 3 of racing went by really fast for me. I had a bit of another frustrating day on the second day, as the wind was very shifty and marginal. The low pressure finally moved on, and the wind dropped to manageable conditions. The girls raced first, and I managed two 20th places, which I knew wouldn't put me in the gold fleet after the qualifying series, as was my goal for the regatta. It was really unfortunate that I hadn't made the time limit on the previous days' races and scored DNFs. After I got home and warmed down from the racing, I became quite sick with flu-like symptoms and went to bed early. Sometimes feeling like crap can be really helpful, because I wasn't feeling so pressured for yesterday's racing. The wind was marginal again but enough to fully plane downwind. It was coming from over the mountain of the island of Portland, making the course pretty gusty, and racing was all about staying in the pressure. I quickly discovered the secret of a successful race: don't go course left unless there was serious breeze visible. Course right was favored and most of the girls went that way on the upwinds, but downwind many were tempted into chasing stray puffs on the left. I went hard right on the downwinds and many times came out ahead, ending the day with a 16th and 12th place. After 3 days and 6 races, the qualifying series is over and we are now split into gold and silver fleets according to scores. Although I had a "gold fleet" kind of day, I didn't make the final cut. When I finished the second race of the day, the measurement boat motored up and told me that my equipment would be inspected. I then got to de-rig inside the measurement area of the Academy facility. Guess they got suspicious of me after a good day of racing. I passed the inspection free and clear. As the qualifying series ends, there is no doubt who is on top: the Spanish team. Their top girl, Marina Alabau, is head and shoulders above every other sailor here in terms of speed and good decisions. She has posted a perfect score of 6 points for 6 races, meaning she's won every race. Five points behind her is the next Spanish girl. It is very impressive, as the two have a reported close rivalry and have been pushed to train together lately. Both have obviously risen to the challenge both mentally and on the water. Among my Polish "teammates," the top youth girl, Maja Dziarnowska, has also risen to her new challenge of being on the Olympic team. Her career is just starting, but already she has had some seriously good races and is much faster than last year. Another girl, Agata Brygola, who didn't make the Olympic team a few years ago (but never gave up racing hard under her own resources), is now in medal contention. Overall, it is very impressive how fast some of the girls in the fleet have improved, and it gives me more motivation to keep up! Today is our lay day and I'm feeling a bit sick again, but have been resting. I'm sure that by tomorrow I'll be ready to go and will have some good races in the silver fleet. After a week of extremely windy conditions, the first day of the regatta was also extremely windy. The morning showed 25-30 knots and the afternoon was definitely 30+ as a few rain squalls came through. Temps were in the high 50s Fahrenheit, and may have even hit the low 60s. We've had 25-30 knots for almost a week now, and it seems that in September, Weymouth is like the San Francisco of England (minus the gnarly chop). The men's fleets raced in the morning, and the women's fleets started after 1 pm. It was a tough day for everyone with lots of falls and carnage around the slalom finish. I had a few decently planned out races, but got tired quickly after falling a lot. I finished the races, but not without a huge effort and several long swims after flying equipment. I even had a run-in with a women's match racing boat that was training near our course, and had to bail out when they jibed into me. Even with all the craziness, I was happy to find that my jibes and tacks are much better even in the very strong breeze, and I am sailing upwind well. Hanging on: Rounding an upwind mark. Preparing for any major regatta is challenging and time-consuming. Of course, training always is foremost, including water time, cardio, and weights. Training is the easiest part, however. The things that take up the most time and energy are logistics, budgeting, and equipment. Having good equipment is always the first concern for a big event. Thanks to my great sponsor, Compass Marketing, I was able to order a new sail for event, and have it shipped to the Sailing Academy. However, preparing a new sail takes a few days of work. The sail must be broken in, meaning that you have to stretch it a bit to know how it will feel during the race. This also allows you to figure out which settings on your boom and mast extension feel good with the sail. This takes a few days of sailing. Breaking in the new sail during a day of training. The sail must then be logoed. Sometimes this is very time-consuming if your stickers are complicated, or you have to make your sail numbers by hand. Cutting and measuring stickyback letters usually takes me around 2 hours. They have to conform to class measurements. Although they look really cool, my sponsor's stickers are a little complicated too. Luckily I had some help. Christoph helps me apply stickers. After this, a giant American flag had to be applied using soap and water. This eliminates air bubbles under the sticker and lets the sticker be easily slid around and positioned on the sail. The water can be pushed out from underneath the sticker by a squeegee or credit card (a good use for my maxed-out MasterCard). The sticker can then be dried in the sun leaving no effect from the water. After preparing the sail, I had to make sure the rest of the gear was up to par. On my old board, I re-did the centerboard gasket and fixed the bottom. The gasket was stiff and had become warped, so I removed it, scraped the glue off, and installed a new one. This was time-consuming as there was a lot of scraping and filling involved, and the gasket had to be sanded to fit flush with each half, and also the deck. On the bottom of the board, there were gelcoat bubbles from the board's exposure to moisture and temperature change during travel. I sanded them off and put gelcoat filler on them. The next day, I sanded the entire bottom of the board. I also worked on roughening my boom grip and replaced lines on the boom and downhaul. I also needed to replace my fin, so I spent about 20 minutes at the Neil Pryde distributor's truck looking through a box of about 15. Not all fins are created equal, even though they are supposed to be. Christoph and I sighted down each fin to see if it was straight, and compared them side by side to determine thickness. Basically, a good RS:X fin will be straight and thin, which reduces drag. We did find a nice one. Then the fin had to be sanded and shimmed to fit in the board's fin box. After all this, all the gear went in to the measurer, who took serial numbers, and approved and stamped the sail, fin, centerboard, mast, boom, and hull. Having a good logistical setup is also important. I'm staying with my teammate Ben Barger, who had a rental car for a day. We spent the entire day shopping for hardware, clothing items, miscellaneous parts for RS:X, used bicycles to get us to the venue, parts for said bicycles, vinyl stickers for sail numbers, British adaptors, and food for the house. I ran out of money because I paid in full for our house, so I was running a tab with Ben. Then he realized he was overdrawn because a check hadn't come in when he expected it. The day of shopping left us both broke and figuring out how to make it through the next few days. Luckily, we are both getting everything sorted. After two days of commuting by bike, we are figuring out how to get around and the timing of riding from place to place. We're also lucky that one of our neighbors has an unsecured wireless network, so we can sit in a front window of the house and have internet access. We are looking forward to tomorrow's racing, which looks to be a very windy day, and getting on a good schedule. It's just another few days in the life of an Olympic-class windsurfer at large in the world.